The 1.5 litre diesel engine option returns up to 74.3mpg providing great fuel efficiency whilst still retaining a sporty feel. The more powerful engines whilst providing better performance still manage to keep fuel economy respectable such as the 2.2 litre diesel engine which returns 68.9mpg yet provides more power. Inside the Mazda 3 the cabin feels comfortable and well built, with the infotainment system taking pride of place on the dashboard. The standard spec is generous with 16 inch alloys, air conditioning, cruise control and the new screen all standard. At the rear boot space is 350 litres so plenty of room for a big shop or trip away. Unique in design, style and layout the all-new and fun Mazda 3 comes with a value for money low starting price. Packed full of features and versatility what makes this Mazda 3 even more attractive is the affordability when using our service. We could save you hundreds maybe thousands of pounds off a new list price. 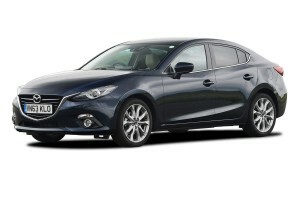 Our panel of UK dealers and franchisors give is direct access to the latest offers and deals on a new list price Mazda 3. Full dealer finance facilities are also available subject to status with a range of finance options to suit all pockets. Getting started couldn’t be simpler, simply fill in the online car builder form and we do the rest searching our network of dealers offers and packages save you money. All this from a simple two-minute form, get started today and save on your new car.